Uncapped players Andy Boyle, Daryl Horgan, Conor Hourihane and John Egan make the cut. WES HOOLAHAN HAS been included in the final Ireland squad to face Wales, though Harry Arter and Ciaran Clark have been ruled out. The duo miss out through injury, while Hoolahan remains in the final squad despite coming off during Norwich’s match at the weekend with a calf strain. Uncapped players Andy Boyle, Daryl Horgan, Conor Hourihane and John Egan make the cut, as does James McCarthy, who has been struggling with injuries lately. Injury has, however, also ruled out Rob Elliot (knee), Paul McShane (hamstring), Liam Kelly (hamstring) and David McGoldrick (knee). Defenders: Seamus Coleman, Cyrus Christie, Richard Keogh, Alex Pearce, John O’Shea, Andy Boyle, John Egan, Stephen Ward. Email “Hoolahan included but Arter and Clark out of Ireland squad to face Wales”. 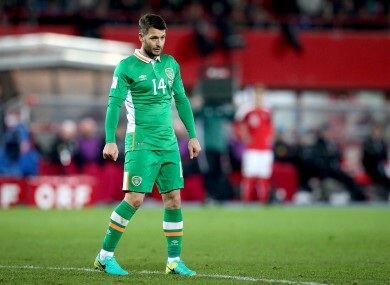 Feedback on “Hoolahan included but Arter and Clark out of Ireland squad to face Wales”.